Winter weddings have such a festive air about it, what with the holiday season and all. So of course, every bride out there is fretting over how to make her upcoming winter wedding bash an event to remember. And what better place to get all your info and inspo than the one and only internet! So of course, being India’s largest wedding portal, we commit to delivering to you juuust what you need. Check out our WinterWeddingSeries for all you need to know on winter weddings! Fashion, colour themes, cocktails, cakes and more included. Flowers are a key note to any wedding, be it spring, summer, fall or winter. They just add such a pretty vibe to the ambience! So though, Indian weddings are accustomed to loud, bright yellows and oranges, we suggest you skip ditch the gendha for some delicate, pretty white flowers. They add an elegant and serene touch to anything! Some of our top white flower picks are baby’s breath, calla lilies, white gardenias and white tulips. Check out more floral wedding décor ideas here! Signboards have a cute, creative look to them and also add a friendly, welcoming vibe to the place. Check out these winter wedding signboards that we find too cute to pass up on! Nothing says winter like leafless branches! Incorporate these as centrepieces for a whimsical look. You can decorate them in a number of gorgeous ways. Crystal or floral strings drapes across the branches happen to be one of our favourites! Duh. Everyone is going to get chilly at a winter wedding night. So warm lighting really does wonders for the ambience. We suggest going for candles because they do add a pretty, storybook/vintage vibe to the place. Check this out for more creative lighting ideas! Not commonly used in Indian weddings, but who says you have to stick to the regular stuff. This one is definitely going to score you plus points for exclusiveness! Especially during those cold AF Delhi winters. Glitter silver is just synonymous with winter weddings. The silver really sets in the wintery mood and the glitter adds the much needed glam! Check out these glitter silver wedding décor ideas to glam up your wedding scene. They work beautifully for contemporary or vintage wedding décor. 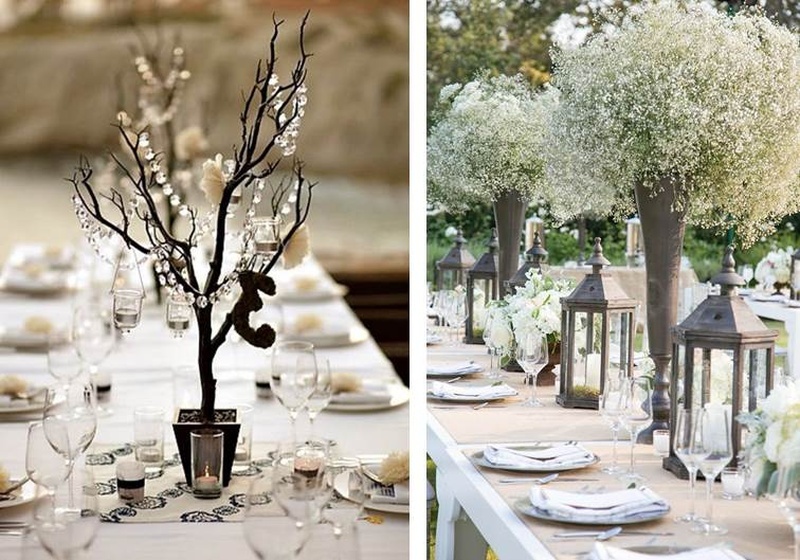 Add the right kind of lights to that and you’ll have yourself the most beautiful wedding ever! Click here for more ideas on crystal wedding décor. Winter and ice go hand in hand. Plus, you’d have a nice winter wedding jam to dance to.